It's sunny outside and kids need things to do. Try to always keep a supply of crafts so when your kids are bored or doing something that they shouldn't be doing entertain them with crafts! Some of these crafts you can do with them or they can do by themselves. Painting clay pots is the perfect activity for a sunny afternoon, suitable for any age group and skill level, from toddler to up, allowing creativity and imagination to run wild. Painted flower pots brighten up balconies and windowsill and make the perfect personalised gift. ~lots of newspaper to save your table from being painted! 1)Wash the clay pot in warm soapy water to remove any traces of dirt or grease. 2)Cover the table or painting area with newspaper, find paints, paint brushes and a mug of clean water (to clean the paint brushes when swapping colours). 3)When the pot has dried, start painting whatever design you like! 4)Ensure each layer of paint dries thoroughly before adding another colour on top. 5)Allow the painted flower pots to dry out. And hey presto! you have delightful one-of-a-kind painted clay pot! Creating a potato painting by making stencils is a fun and easy kids craft project for a rainy afternoon. Just convert a potato into an easy stencil to create a variety of interesting patterns and pictures. 1)Cut the potato in half and dry it with some paper towel. 2)Then draw a simple shape on it. Hearts, Xs, and circles work well. 3)Use the knife to cut away the potato around the drawing, so that you are left with a 1/3 inch raised design. 4)Blot the potato with paper towel again, then dip the raised design into your paint and stamp it onto the paper. 5)Repeat the process until you have the desired design. The stamps can be arranged to form a pattern or a flower or house. You can add additional detail with colored crayons, eg two stamped circles could become two balloons, just by drawing in the strings. 6)Leave the painting to dry. **Instead of using a knife to carve out the design, you can use cookie cutters - simply press into the potato after cutting in half, and remove the excess around the cutter. These popsicle paints are a fun summer crafts for kids. Just make sure you make a lot because they may melt before you've finished having fun with them! 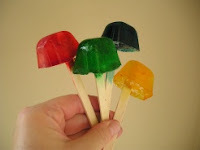 Just make sure the children you are doing this craft with know that these 'popsicles' don't go in the mouth! •A container to make your paints in like an ice cube tray (as in the picture) or a real Popsicle container. 1. Fill your container with water and add 5 drops of food coloring in each section. Make as many colors as you wish. 2. Insert the popsicle sticks into each section. They don't need to be straight. If you are using an ice cube tray you can cover with cling wrap and insert the sticks through the wrap to keep them straight. 3. Freeze until solid and then you're ready to bring them outside..paint on paper, paint the side walk or fence, make some wonderful creations! 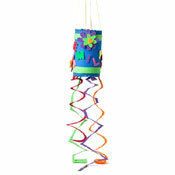 The Blowin' in the Wind Windsock project is perfect for a Hodge Podge Crafts event. If you are a Mom or Dad planning a party, or a school or local park district looking for ideas with some left over crafts, the windsock craft project is perfect. 1. Cut a piece of foam 7-½” x 16” with regular scissors. Cut the two long sides with wavy edge scissors. Punch holes along wavy edges using hole punch to create a lacy edge. Following directions on glue bottle, glue short edges, overlapping at least 1” to create a cylinder. NOTE: Hold glued edges together with clothespins until dry. 2. Cut two strips 1” x 15” of a different color foam. Glue around top and bottom to create stripes. 3. Spell out name or word with Fun Foam letter. Glue in place. Apply Fun Foam shapes in various sizes and colors to create your own unique style. 4. Layer and glue different colors and shapes of flowers. Glue randomly on cylinder. 5. Add metal brads in several places to add sparkle and dimension. 6. Cut streamers in different shapes - circles, oval, squares. Attach to windsock with brads through holes around bottom edge. 7. Cut ribbon in half. Fold in half and tie in a knot about 5” from fold to hold together. Attach loose ends, evenly around top edge of cylinder with brads to create hanger. 8. Add any extra accessories to personalize your very own windsock! Make these cute bug friends to embellish your flowerpots and mark garden rows. 1.Trace patterns onto tracing paper. (see link below) Cut them out. 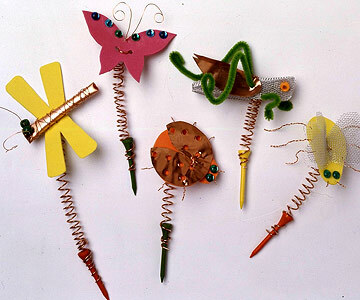 2.Trace patterns onto copper sheets, crafts foam, and wire mesh and cut out as follows: from copper, two grasshopper wings and one ladybug wings; from yellow crafts foam, one dragonfly wings, one firefly body; from orange crafts foam, one ladybug body; from wire mesh, firefly wings; from pink crafts foam, one butterfly body. Punch 3/16-inch holes in cutout pieces as indicated on the patterns, folding wings and bodies in half to reach inaccessible areas. 3.Cut a long piece of 16-gauge (the thicker) copper wire; wrap it around a pencil to make a long coil. Slip the pointed end of a golf tee through the bottom two or three coils, then tighten those coils around the tee. Repeat to make one for each flower marker. 1.Cut a 2x3-1/2-inch piece of copper. Starting at one long edge, roll the copper into a cone for the body. Trim ends. Randomly wrap the body with 24-gauge (the thinner) copper wire. Wire on green pony-bead eyes. Add wire antennae at the head. 2.Slip the top coil of a golf-tee assembly through the wing holes. Pinch the coil to secure. 3.With thin copper wire, attach the body to the wing/golf-tee assembly using punched holes. 1.Cut a 6-inch length of 24-gauge copper wire for the antennae. Push the ends through the foam at the tiny circles on the pattern. Twist the two wires together close to the foam. Curl the ends. 2.Slip the coil of the golf-tee assembly through center holes. Pinch the coil to secure. Glue cabochons to the wings at the Xs. 1.Cut a 3 x 4-inch piece of wire mesh; roll into a 4-inch-long tube about 3/4 inch in diameter for the body. Press one end flat horizontally (for the tail) and one end flat vertically (for the head). Trim straight across the tail end and in a slight curve across the head end. Use thin wire to attach orange pony-bead eyes to the head. Twist the wire ends to secure. 2.Cut a 6-inch length of green chenille stem for front legs. Push half the stem through the body. Bend the stem into leg shapes. 3.Starting 1/2 inch from the arms, push half a full-length chenille stem through the body for back legs. Punch holes in the copper wings. Slip a wing on each back leg. Use a piece of thin wire to secure the wings. Bend the chenille stem into leg shapes. 4.Slip the top coil of the golf-tee assembly into the mesh body. Pinch the coil to secure. 1.Cut six 2-inch lengths of thin wire for the legs and two for the antennae. Push pairs of wires through the foam body at the tiny circles. Twist ends of each wire pair together; trim to desired length. 2.Set wings atop body. Slip the top coil of the golf-tee assembly through the holes in the body and wings. Pinch the coil to secure. 3.Glue cabochons to the wings. 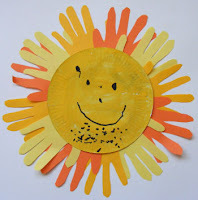 Bring a little sunshine into your home with this super easy sun handprint craft for summer! 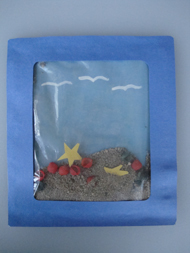 And as it involves some painting, some tracing, some cutting and some sticking, it proves a particularly popular craft for kids! 1)Start by painting the paper plate and leave to dry. 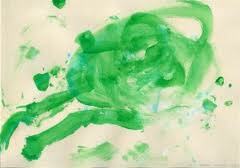 2)In the meantime, trace around your child's hand onto the three colours of construction paper. You will need about 12 handprints. A mixture of colours looks great but you could just use yellow if you prefer. Cut out the handprints. 3)Use the black marker to draw a cheerful face on your sun. If you are using a permanent marker, you should supervise this bit carefully! 4)Now turn the sun over and stick the handprints around the edge to form the rays.